Dong Phong Art Gallery is pleased to presents Solo Show "Vu Trung - Trifles" at #3 Ly Dao Thanh street, from 6 March to 6 April, 2019. 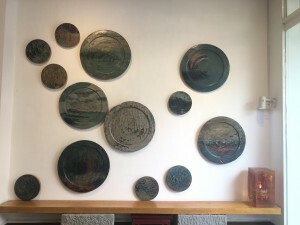 At this show, we have a chance to contemplate 17 pieces in which the artist has painted lacquer on normal household appliances such as small wooden trays or cutting boards. The exhibition will be open all week from 9:30 in the morning to 6:30 in the evening.